Lightweight concrete overlay bag mix systems for vertical wall applications. Sprayable cement wall coating to replace conventional labor-intense stucco installation over brick, concrete block, foam and wood. Single component bag mix for stamped concrete walls and carving. Transform the appearance of retaining walls, storefronts, building fascades and other vertical surfaces in North Carolina or South Carolina using a just add water lightweight concrete overlay bag mix for walls. WallSpray is a lightweight thin concrete texture overlay system used to resurface or texture virtually any vertical indoor or outdoor surface. WallSpray may be applied by texture sprayer or trowel for a variety of finishes including knock down, lace trowel, bubble, plaster and other finishes. The just-add-water vertical concrete overlay is applied directly to prepared concrete walls, concrete block, brick, ICF, polystyrene foam, drywall, plaster and painted surfaces. WallStamp is a thick concrete wall overlay for stamp and carved textures. The just-add-water vertical cement overlay bag mix will not sag or slump up to 0.75 inch thick. Vertical wall texture with WallStamp ranges from natural stone to wood, brick, slate and other designs. Use WallStamp to transform the appearance of interior and exterior walls. Additional information on these cement systems for vertical applications. Wall coating and wall texture systems. WallSpray by SureCrete Design Products is a cement based thin concrete texture overlay for vertical surfaces in North Carolina and South Carolina. It creates a wide range of finish textures from a simple knock-down to sophisticated faux Venetian Plaster. WallSpray concrete wall overlay may be applied by texture sprayers and by trowel. Restoration, repair, resurfacing, architectural accenting, and surface protection of existing cladding are all accomplished with Wall Spray. Typical vertical concrete projects include retaining walls, entry walls, columns, gable ends, fireplace accents, and any other vertical surfaces or walls. WallSpray concrete wall overlay is formulated to provide excellent bond to concrete, concrete block, ICF, polystyrene foam, drywall, plaster, plywood, and even painted surfaces. 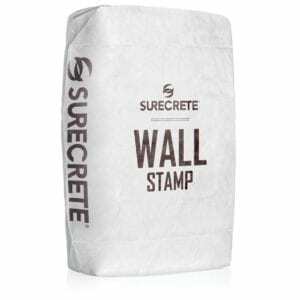 SureCrete Design Products WallStamp is a concrete wall stamp overlay bag mix that can be stamped and also carved with conventional vertical concrete tools. Special formulated for applying on a vertical surface with little to no slumping or sagging at 3/4 inch. Add color to enhance depth and design on any project in North Carolina or South Carolina. WallStamp is a lightweight, single component just-add-water cement overlay material designed for both interior and exterior vertical surfaces. Wall Stamp is formulated to provide an excellent bond to concrete, concrete block, ICF, polystyrene foam, drywall, plaster and plywood.